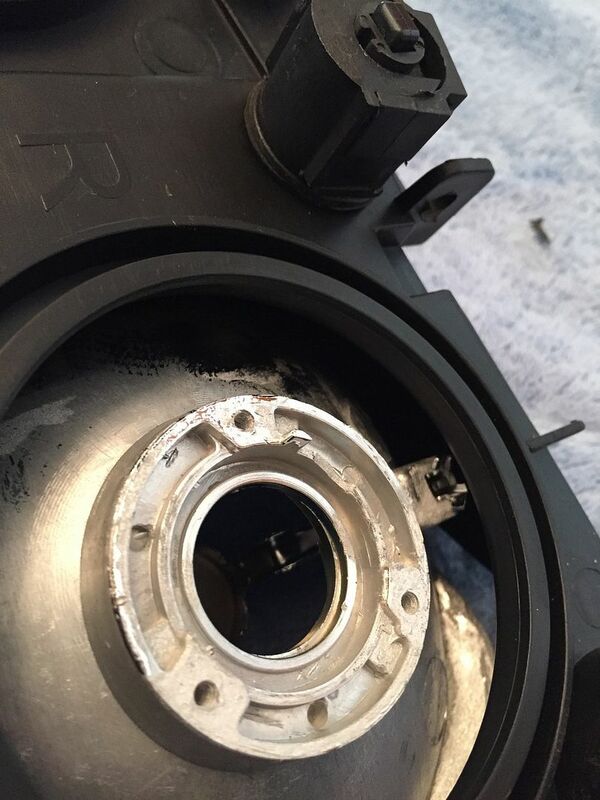 So I recently did a Morimoto HID retrofit in my HD so i figured I would do a little write up on what exactly I did and show you the problems I had trying to get this to work properly. 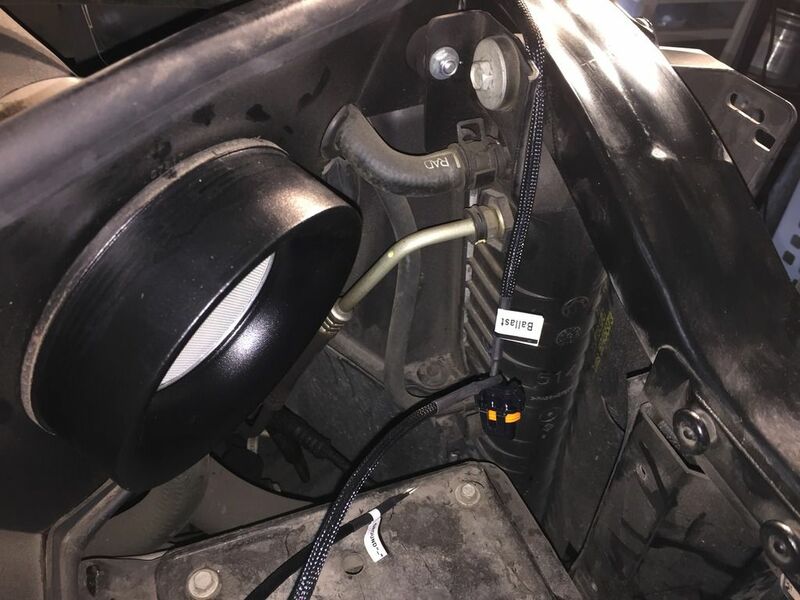 A word of caution: You will be doing some major modifications to your headlight housing, and you wont be able to return them back to stock. 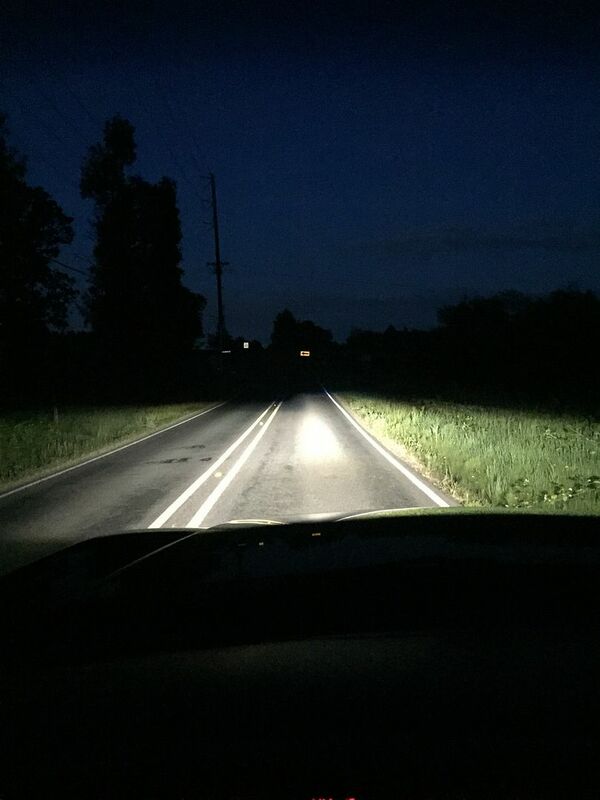 Lots of people buy aftermarket headlights before they start this process, but that can also lead to problems (which you will see later). 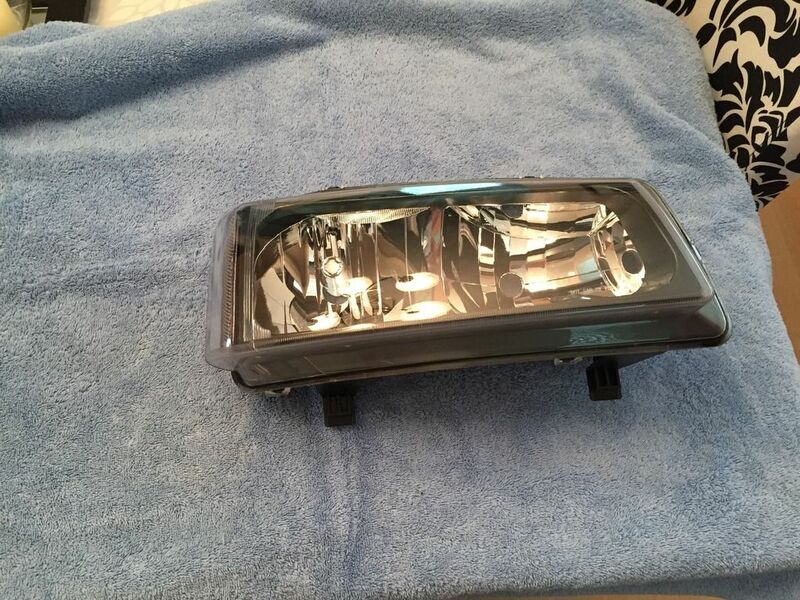 I happened to already have a set of aftermarket clear headlights and I also had my stock headlights. I ran into some issues and the process took me longer than I thought. 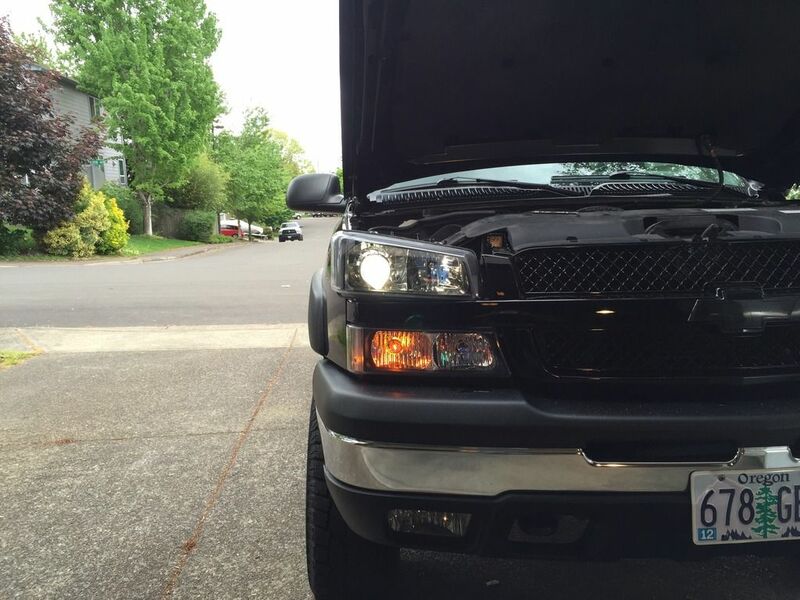 Luckily I do not drive my truck a whole lot, and I have my stock headlights. So I was able to put the stockers back in. If everything goes well this process should only take you a few hours. This kit comes with basically everything you need to install. I say almost everything because it may take some custom work in order to get it to work properly for you application. I will get to that later. There website also has basic step by steps on how to install everything. 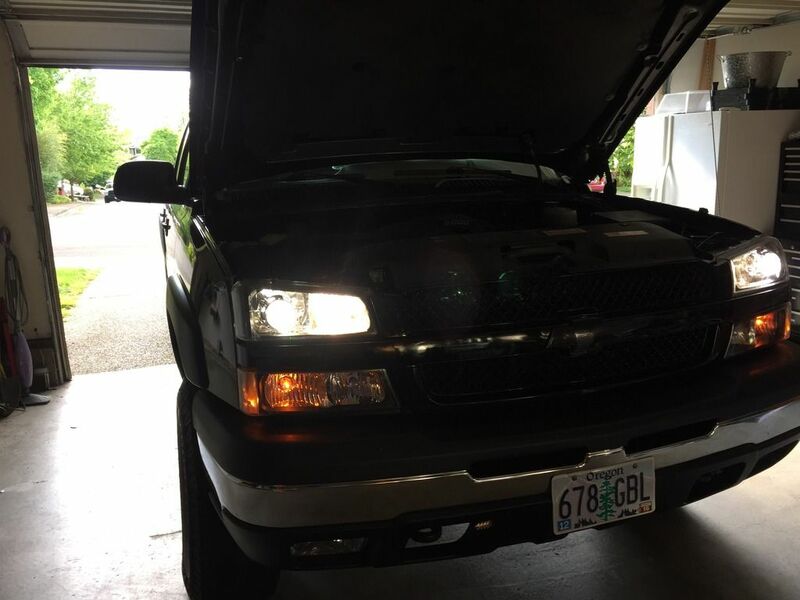 I searched the interwebs for hours trying to find write-ups on how to do a retrofit in an 03-06 Silverado, but most of the walk thoughts are for the NNBS trucks which are a million times easier. 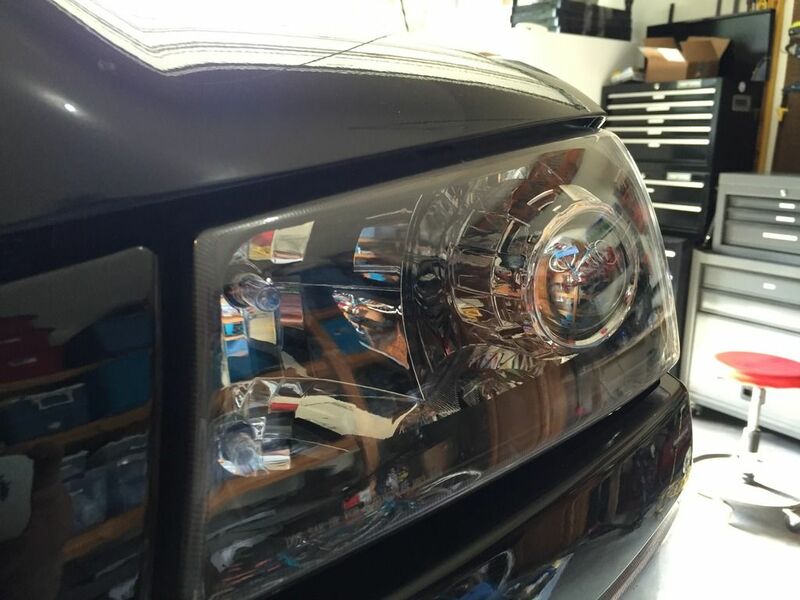 I found this write up on HID planet and used it as an example, but I had to deviate from what this person did because my headlights were little different.This person did a Quad retrofit and I just did the low beams. I think all 4 is overkill. 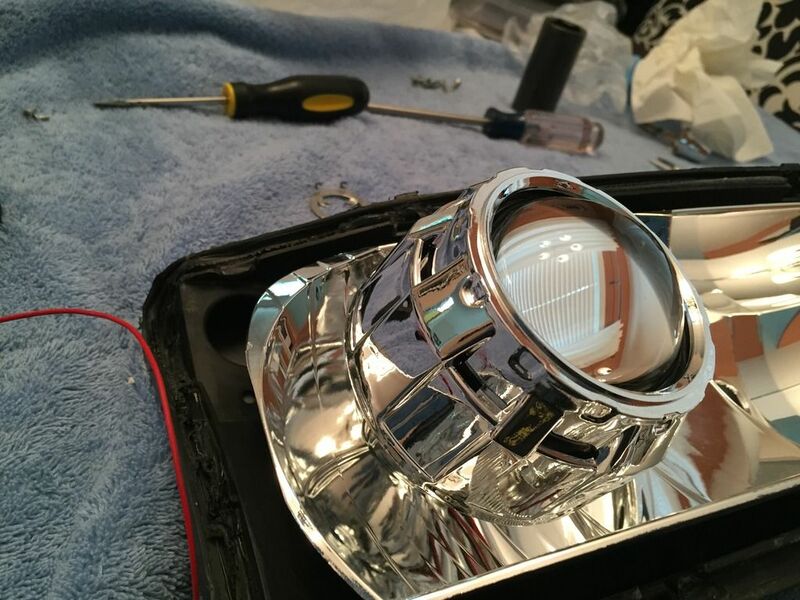 First thing first, you have to take apart your headlights. If you do not know how to do this I know there are plenty ow write ups on this site and on the internet. But it is super simple. First you have to take the bulbs out, and turn your oven on to the lowest setting, hopefully that is around 170 degrees. Place your lights (one at a time) in the oven for about 10 min. I would not go over that. Then pull them out and you can begin the process of pulling them apart. 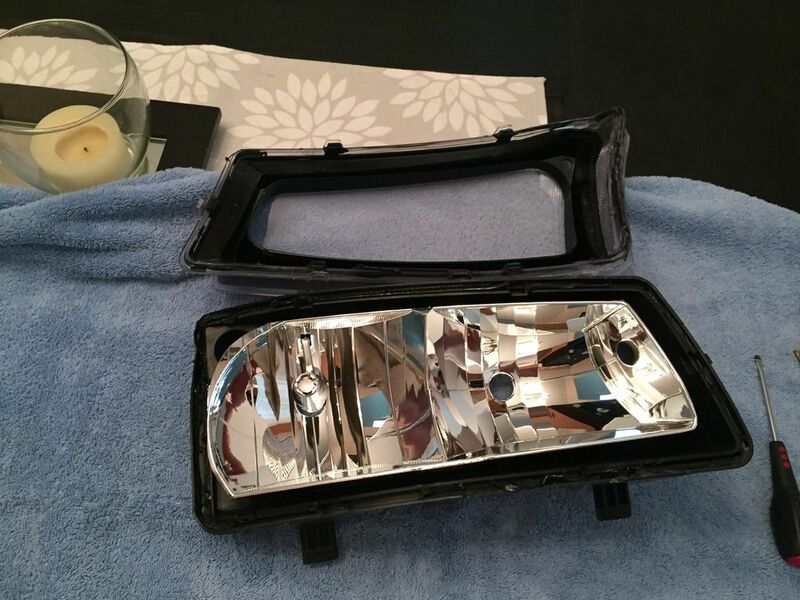 I did this years ago and i used a butter knife to separate the headlights. This time I used a small flat head screw driver to stick under the clips the separate them, and i used a larger flat head to separate the lens from the housing. Be very careful not to break the clips or it will be a pain to get it back together again. 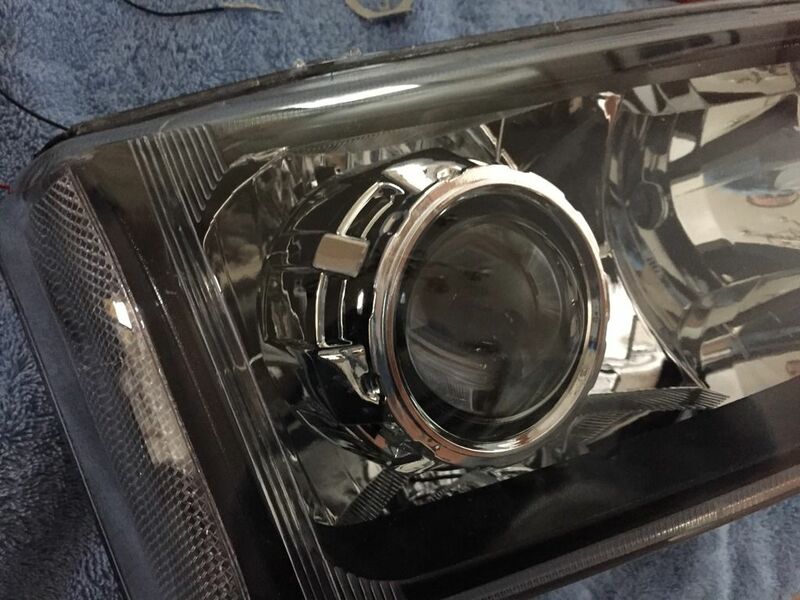 Note: I have a cheap set of ebay clear headlights and they pull apart really easy. 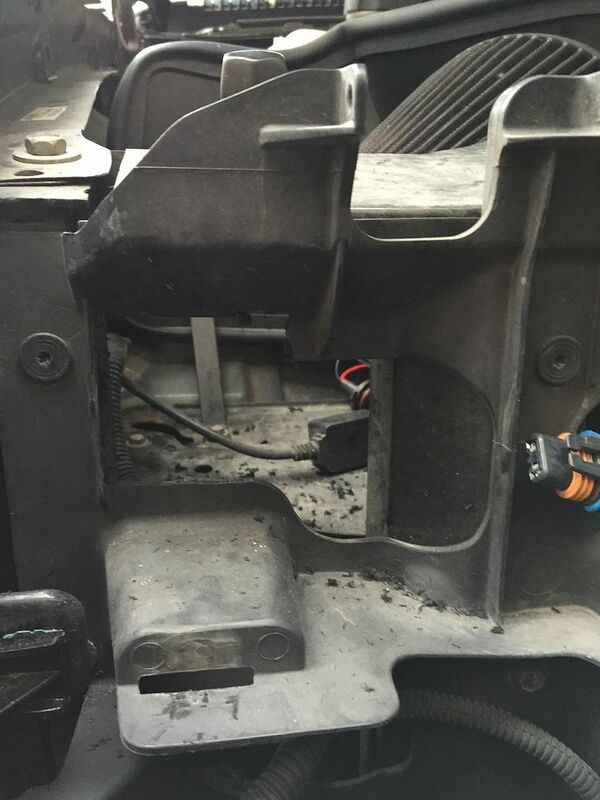 I have been told that stock headlights are even harder to take apart. Also I would recommend wearing disposable gloves when working on this process. 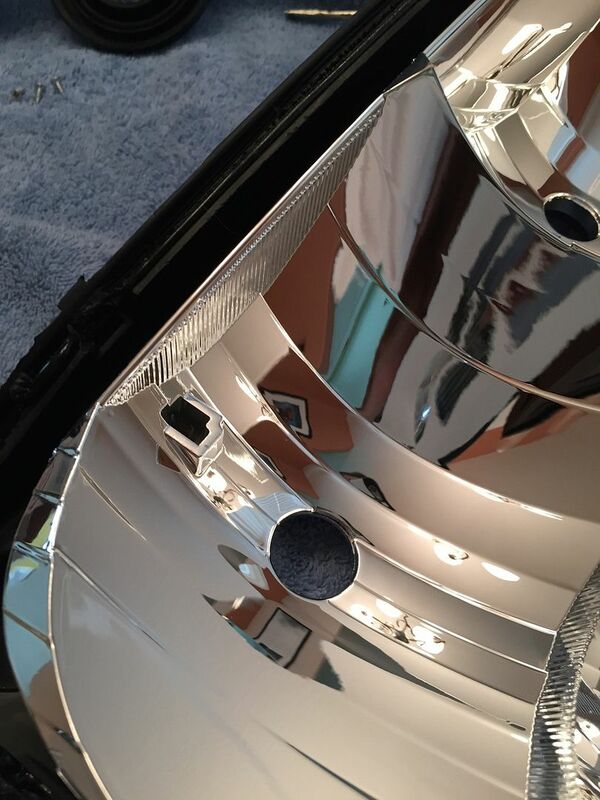 You do not want to get finger prints on the reflectors, or the projector housing. 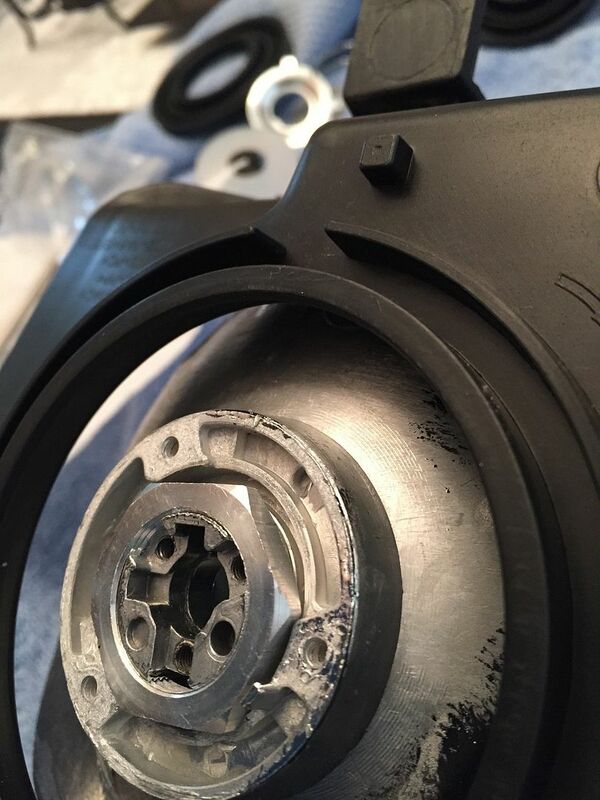 Next you have to unscrew the 3 screws holding the plate on the back, and remove the rubber chunk from the back. 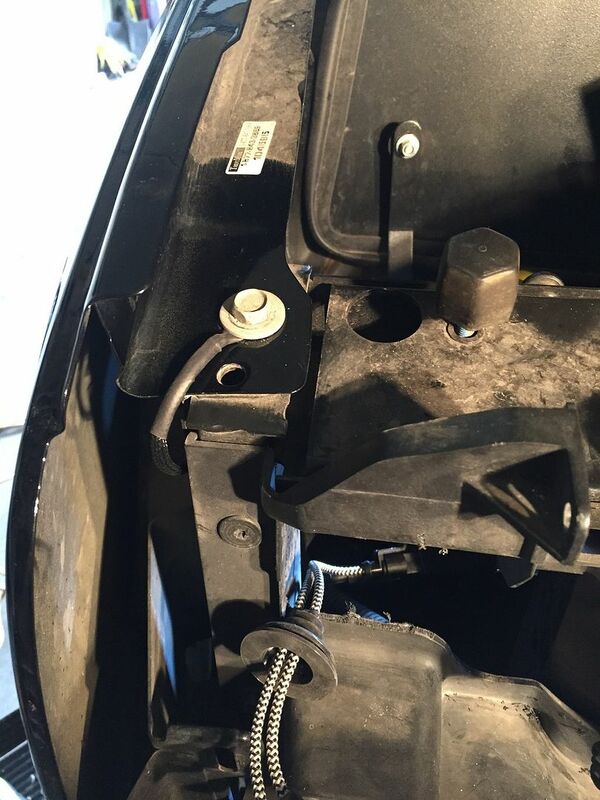 Then you want to remove the little part in the housing that helps project the light from the low beam. It is super easy. In the picture above you can see that all you have to do is reach in there with some needle nose pliers and squeeze the 2 parts together and it can be removed easily. 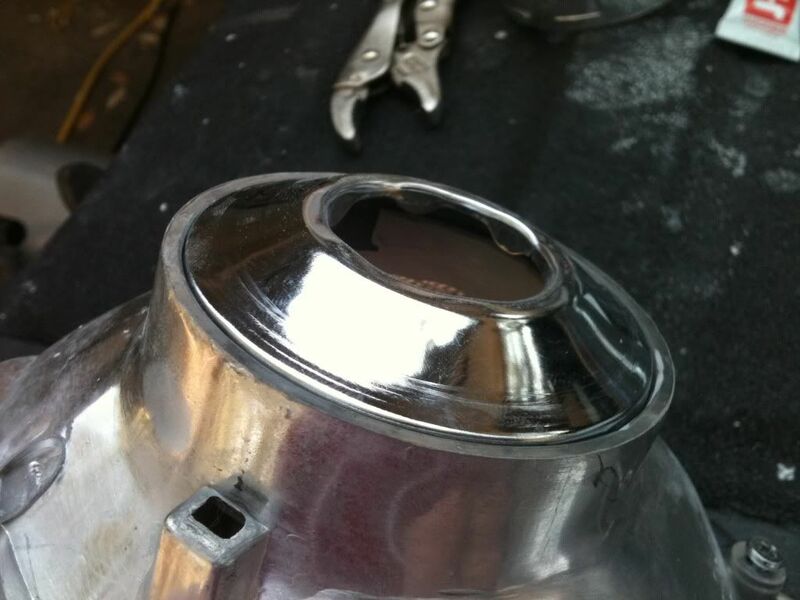 But as you can see there is not enough room to get the lock nut to work properly, so I had to do a little Dremeling. 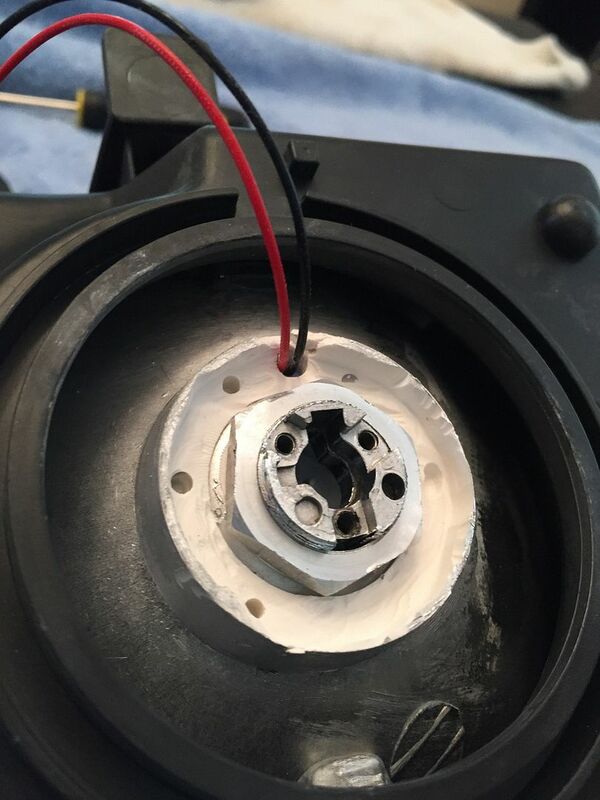 I Dremeled it out enough to get the lock nut to work.I also drilled a hole for the wires that operate the bi-xenon projectors. 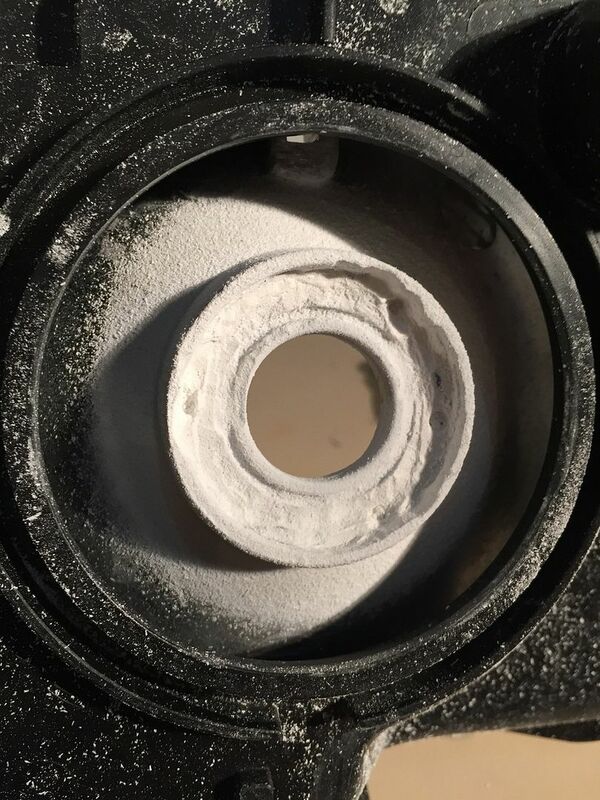 With the projectors easily installed (or so I thought) I decided to check to see if the lense went back on to the housing. Well of course it does not. The Projectors are way to deep to fit in the stock housing without doing some major modifications. I ended up having to dremel out even more, and make a larger hole. I made the largest hole possible so the projectors would sit back further. As you can see below there is a major difference between the cheap ebay housing and the stock housing. 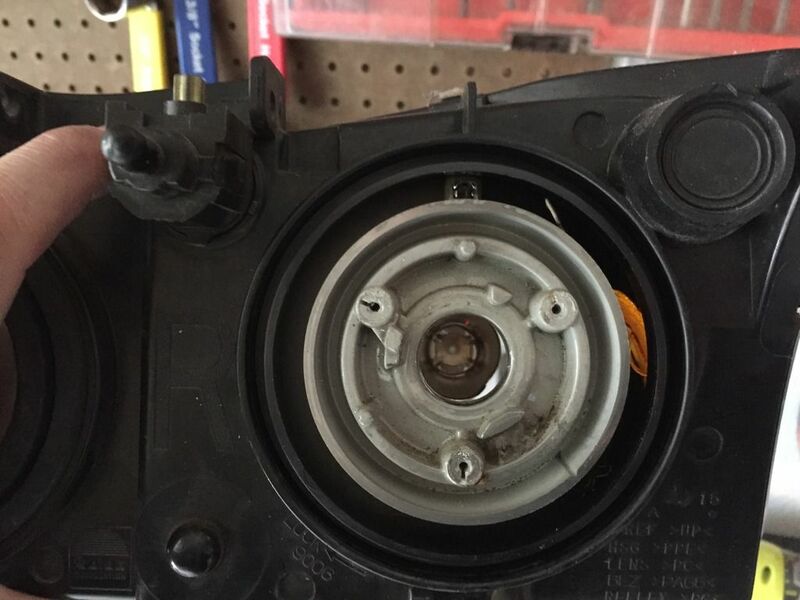 The stock housing has more plastic, and an outer ring that would make the install much easier. 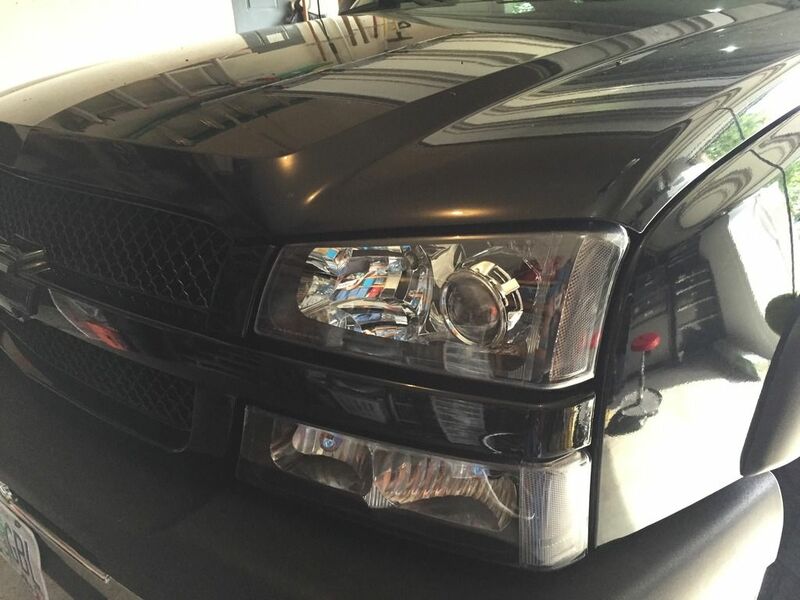 Since my headlights are different I was not able to make a custom bracket that would work. So I drilled out the hold as big as I could to fit the projector as far in as I could, and still be able to attach them. 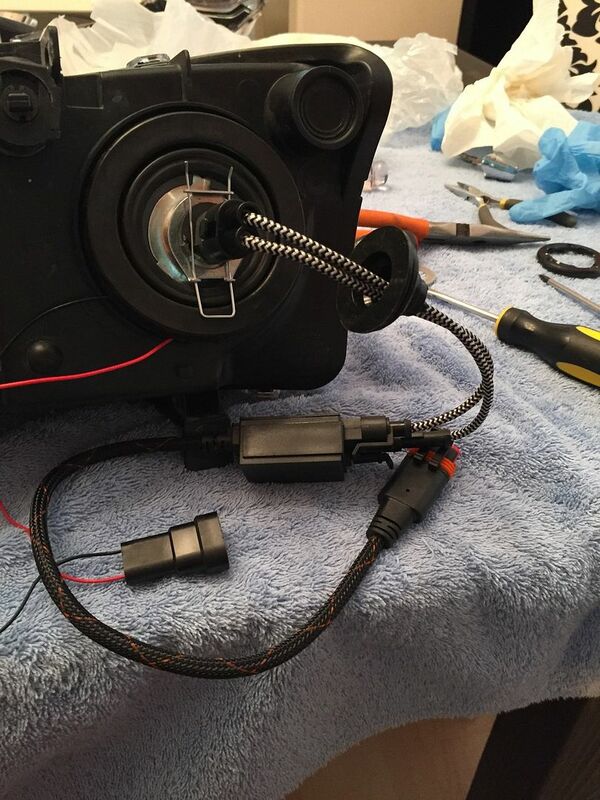 I attached the projector shroud to the projector, and then I slid the projector into the hole, and used the rubber grommet that came with the kit to lick everything into place. 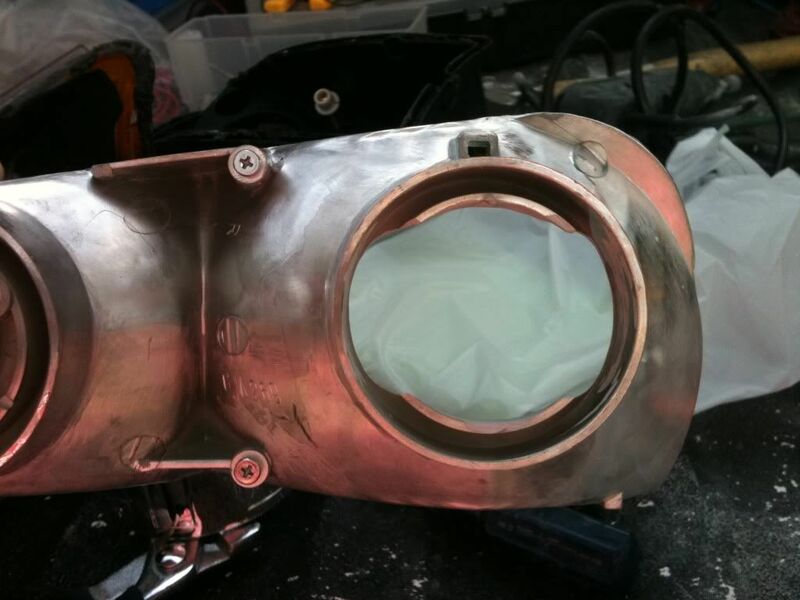 Make sure that the projecttors are straight in the housing and tighten with the 27mm socket. 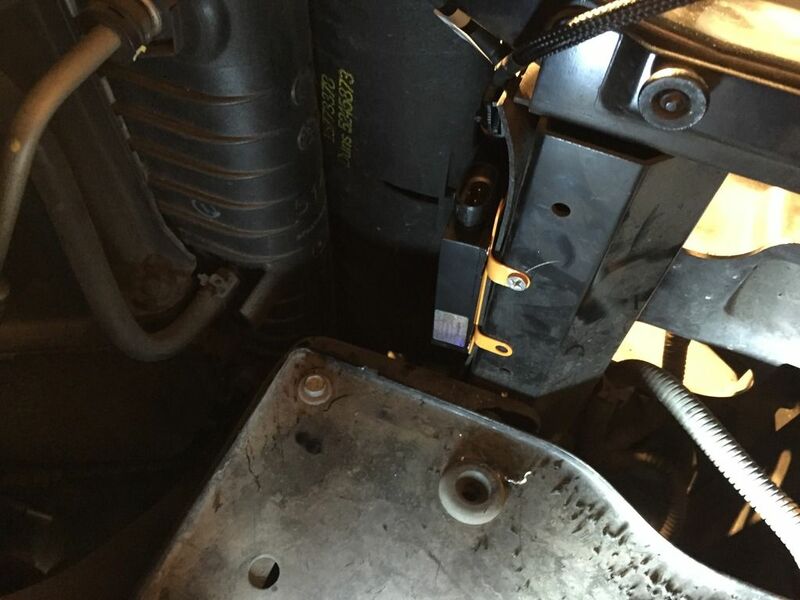 you may be able to just tighten it with pliers but the socket seems to work better. Once you test it out you may have to turn the projector a little bit to make sure everything is straight. I then put the lens back on to see if it fits. It did, but just barely. I ended up having to squeeze the lens very hard to get it back together. 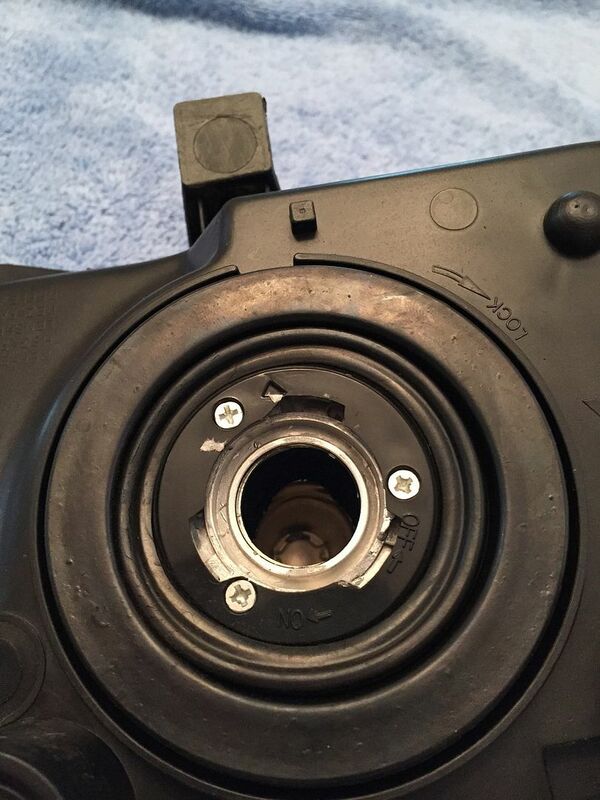 And this is why it is very important to not break the clips that attack the lens to the rest of the housing. 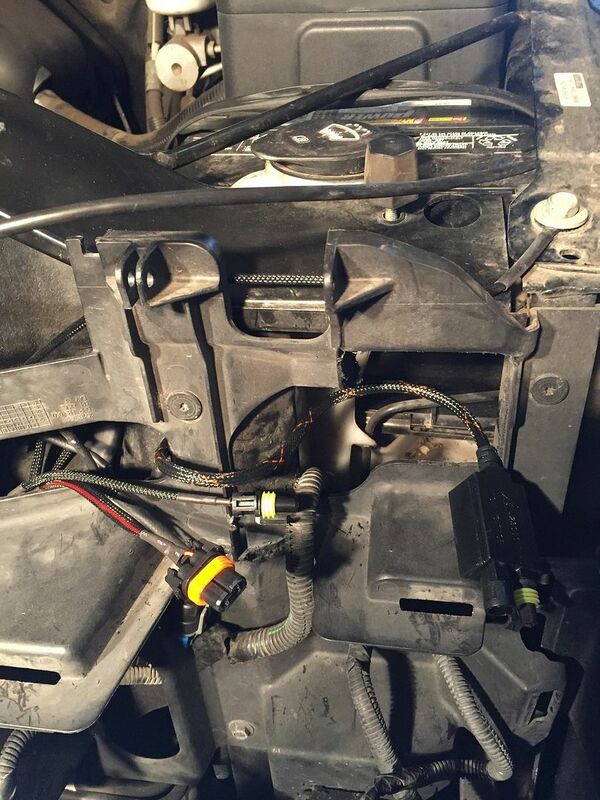 I then hooked up the HID kit to make sure it worked, and as you can see it did. 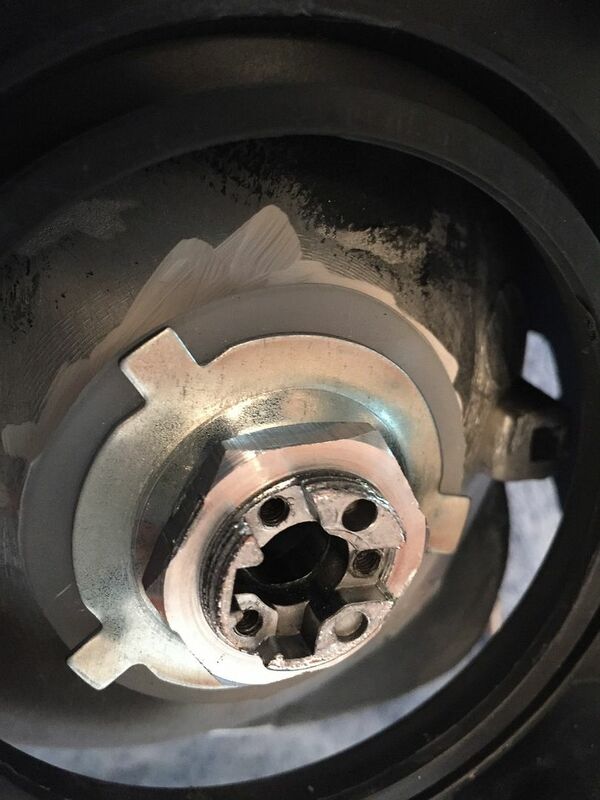 I then started working on the next headlight, but I tried to tighten the lock nut to tight, and i stripped it, but luckily The Retrofit Source has replacements. But I had to wait a few days to receive it. While I was waiting for the replacement part I installed the wiring harness that come with the kit, and mounted the balasts. 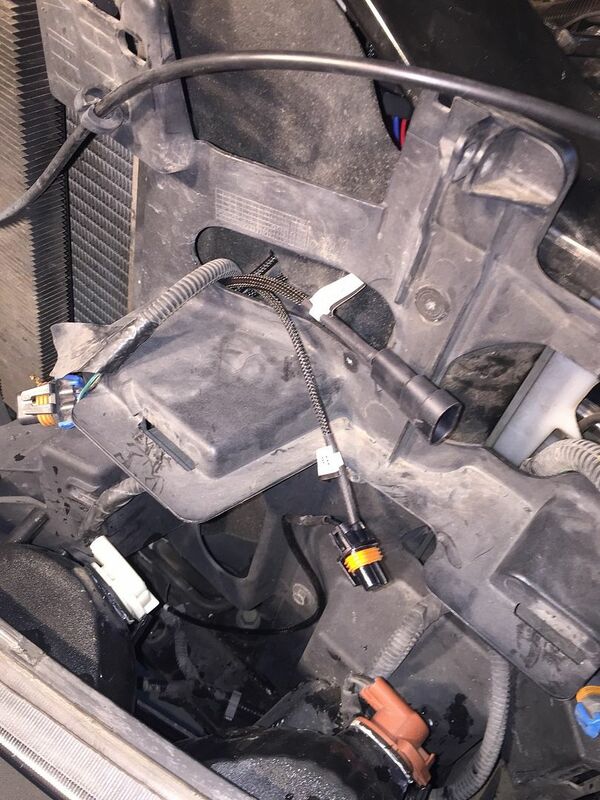 The wiring harness does not give you a very long wire to go from the driver side to the passenger side. 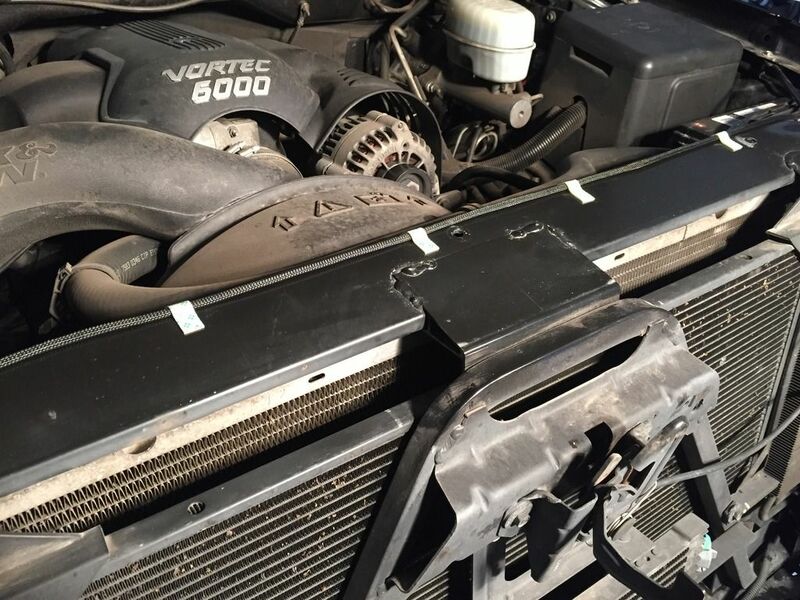 I ran the wire across the top of the radiator suport, and used sticky tape to hold it down, and then the radiator cover goes right over the top. 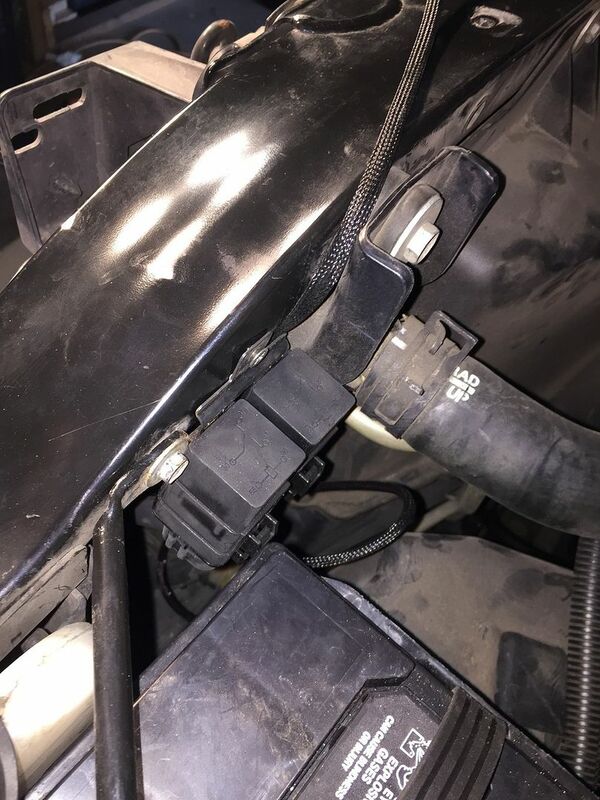 I installed the gound wires in the location you will see below. You may find a better place to install everything but this is what worked for me. And Here is the light output. Sorry these are not the best pictures I will try to get better ones soon. 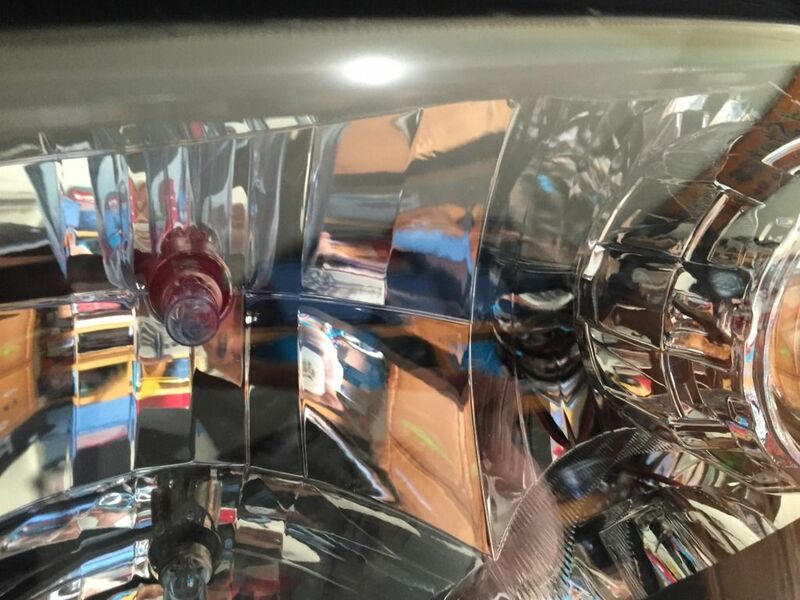 Also these pictures show that I need to do a little adjustment to the driver side headlight. It needs to be straightened out a little bit. So if you dont know how bi-xenon projectors work it is pretty simple. 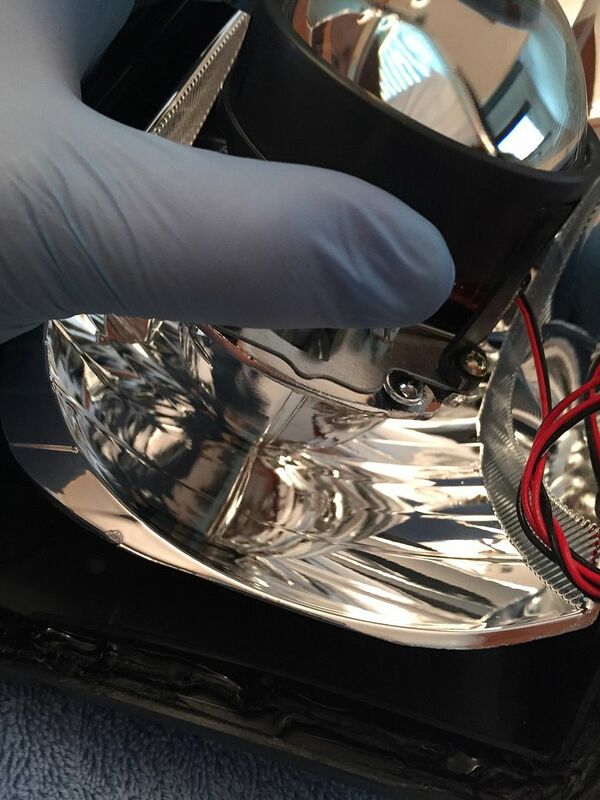 There is a shield built into the projector that focuses the light for the low beams. 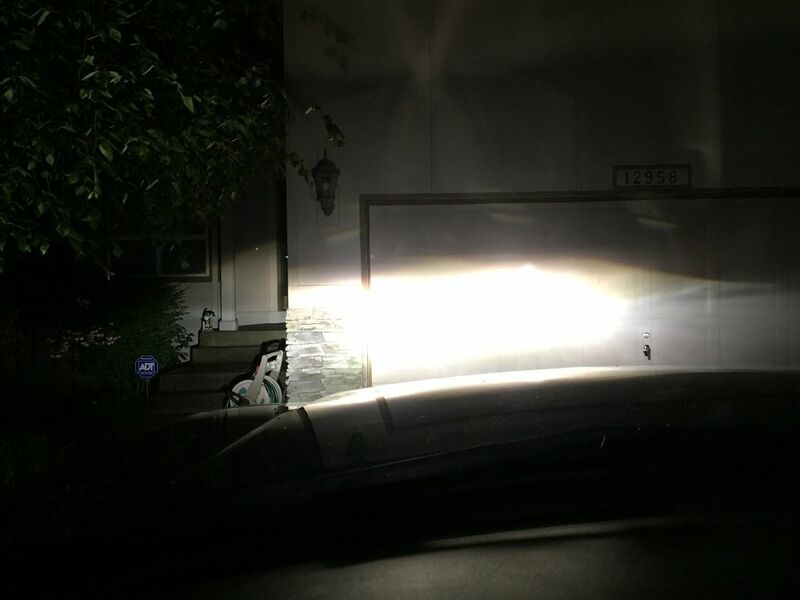 Then when high beams are turned on it activates a solenoid that drops the shield out of the way allowing for full light output from the bulb. Now this is extremely important!!! 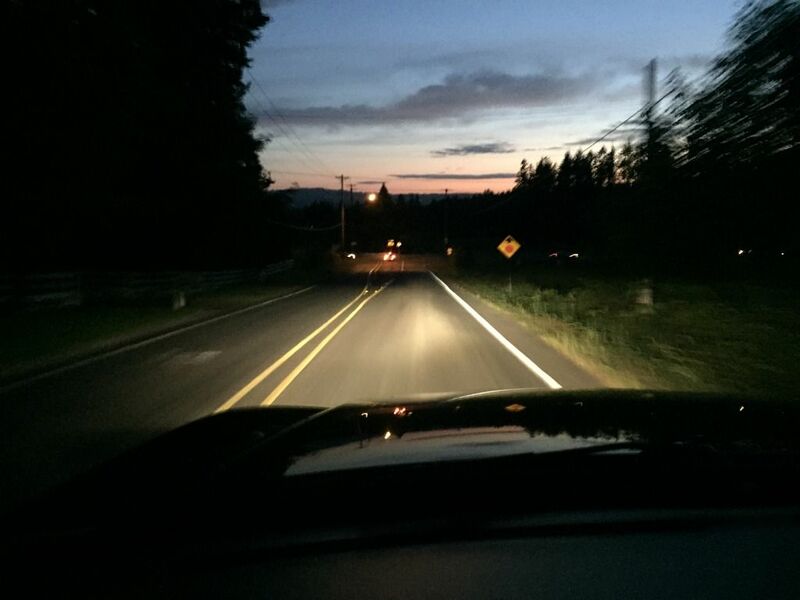 If you do not do the 4-High mod, every time you turn on your brights the HIDs will go off, and when you turn your lows back on the light will be verry dim and it will take a second to heat back up. This is extremely dangerous. 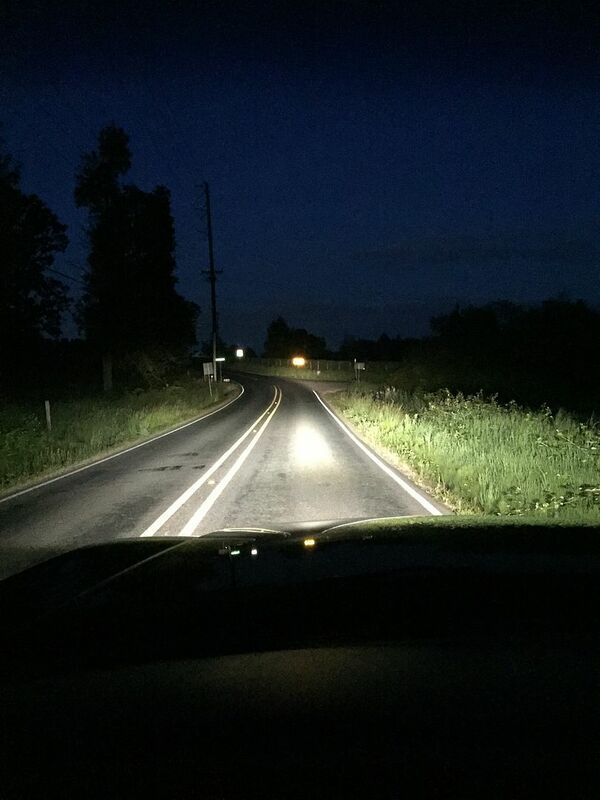 So anytime you have HIDs in your lows you should perform the 4-high mod. Nice write up Dan,I hope to do this soon myself. 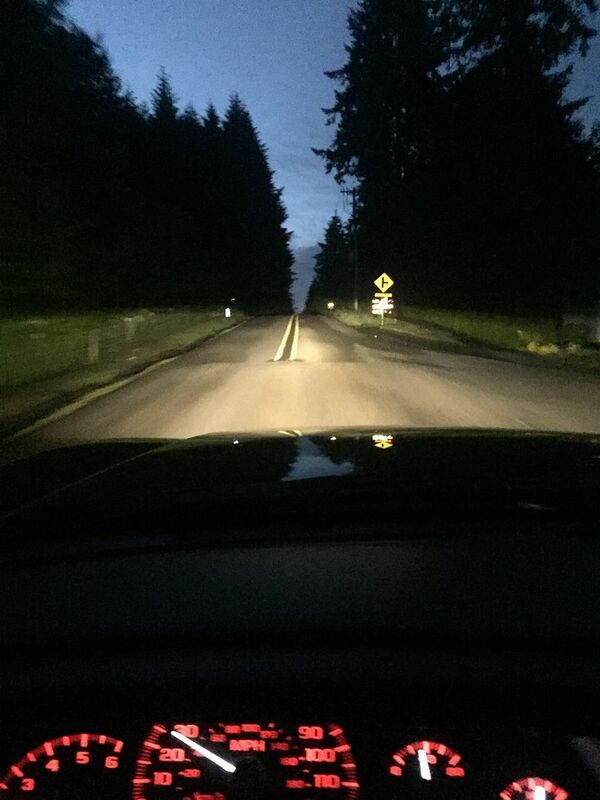 Where did you buy the Hids from? Hell a nice write up Dan. They look good. Pretty bright. Looks like a lot of work. Nice write up. Lots of pics are always helpful. But there is another issue. My lights have been adjusted as high as they will go, but its not high enough. The adjustment for the passenger side lights is broken so I cant adjust them at all, so they are stuck where they are at. As soon as I bought those headlights I notices they were aimed way too low, and I could never adjust them properly. 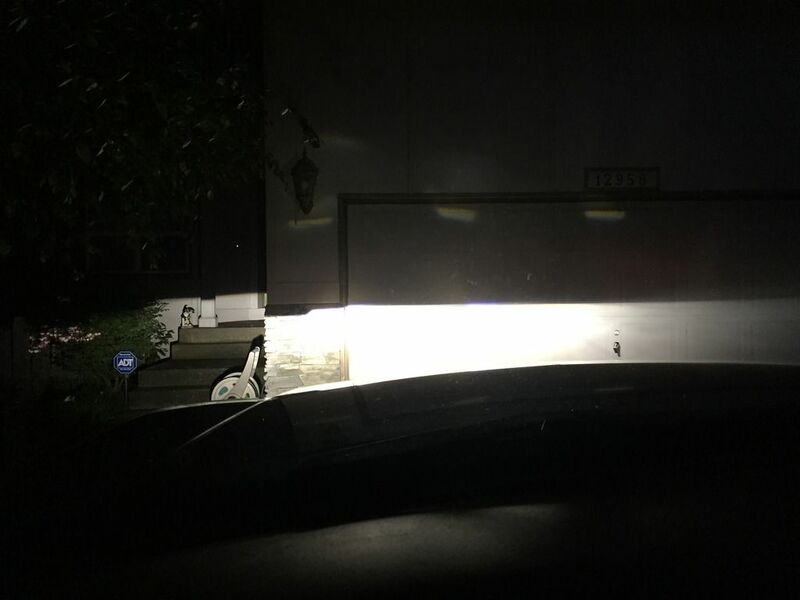 I guess thats what i get for buying cheap ebay lights. Though I have never had problems with them in the past. As you can see in the picture below, the cut off lines are way to low. 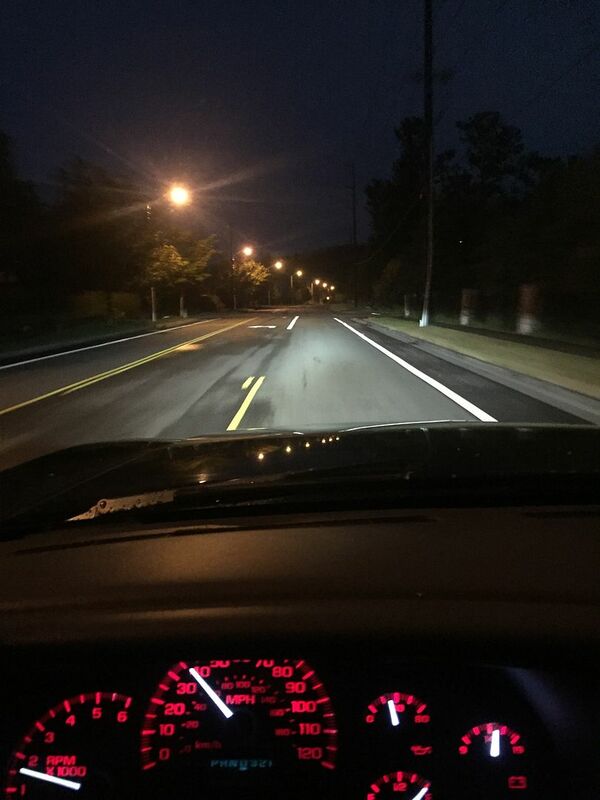 It would be just fine driving around the city, but if I ever get out on a dark road It will be way to easy to out run my headlights. I think I got them adjusted. 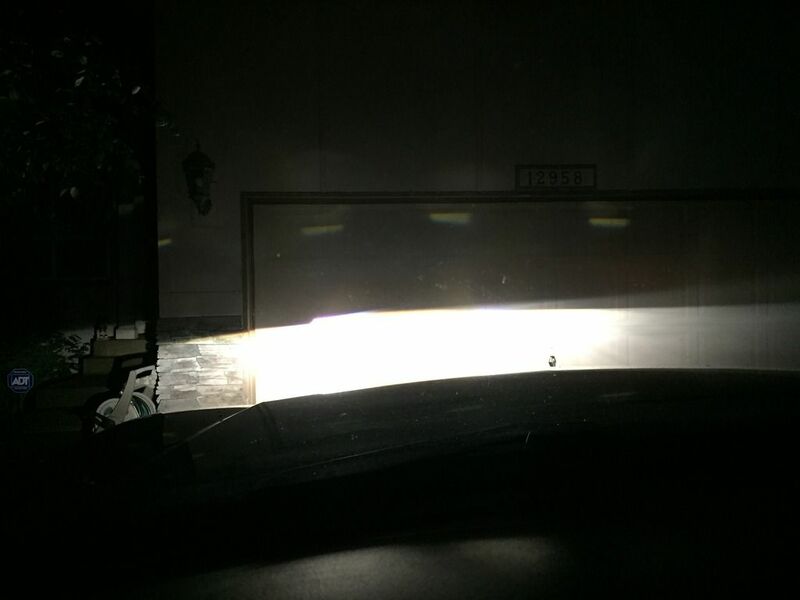 Im trying to find that line between being able to see, and not being so high that I blind other people and risk getting pulled over for having HIDs. 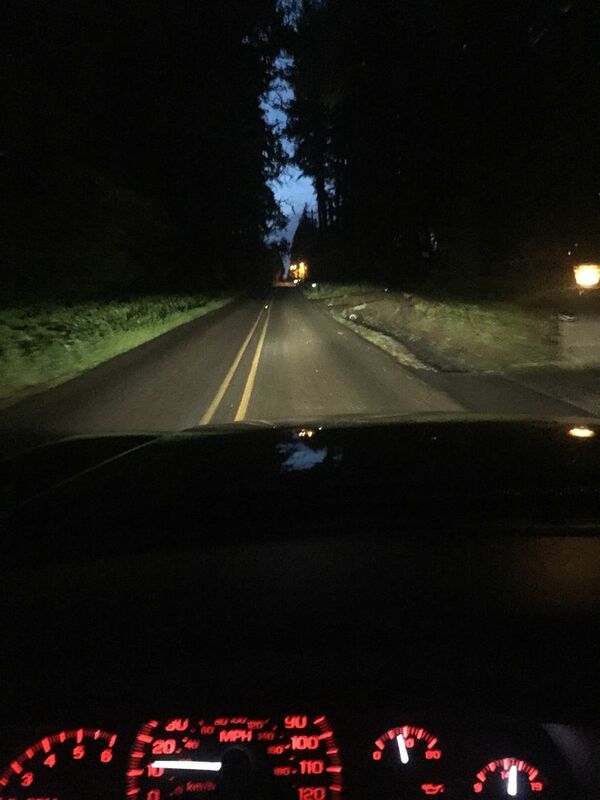 I guess cops in the metros areas of Portland and Seattle are cracking down heavily on vehicles with HIDs. Do you still have the pictures? Seems, they don't show up anymore.